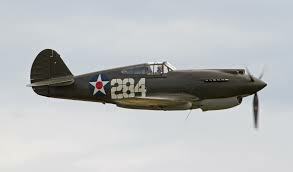 On November 2, 1942, two U.S. Army P-40 fighter planes, based at Hillsgrove Army Air Field in Warwick, were on a training flight over Narragansett Bay when they collided in mid-air. One plane, (41-14135), piloted by Staff Sgt. John W. Smallseed, 21, of Newton Falls, Ohio, suffered minor damage and was able to return safely to Hillsgrove. The second plane, (41-14183), piloted by 2nd Lt. William H. Pierson, 23, of Chicago, suffered heavy wing damage, and he was forced to bail out. After the bailout, Pierson’s plane continued on and crashed in the center of the intersection of Barton Street and Grand Avenue in the Warwick Neck Section of the city. The aircraft narrowly missed an automobile being driven by Edward W. Thurber of Pawtuxet. The explosion of the P-40’s impact spewed debris and gasoline onto his car setting it on fire. Thurber, not knowing for sure what had just happened, jumped from his flaming car and allowed it to roll down a hill where it came to rest in a vacant lot and continued to burn. A home at 49 Barton Avenue was also set on fire, but the owner was able to extinguish the flames with a garden hose. Mrs. Forrest B. Morgan of Grand Avenue told reporters that she had been standing where the plane crashed for twenty minutes waiting for her daughter. She had just started back towards her home when the plane hit and was not injured. Meanwhile, Lt. Pierson was seen landing in Narragansett Bay where he disappeared after hitting the water. Four volunteer firemen from the Conimicut Fire Department launched a boat to rescue Pierson, but needed to be rescued themselves when their boat capsized in the rough water. Some reports were later received that Pearson had been rescued, but these were found to be in error. He was officially reported as “missing”.